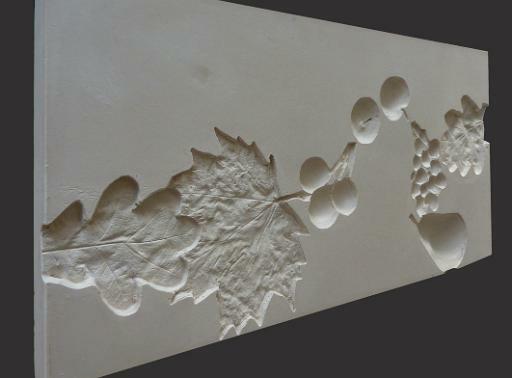 I've been working with the same concept used in my Architectural Frieze collections but this time creating stand-alone wall sculptures rather than long friezes - though still indenting the imagery to the surface. This was a real acorn leaf and mini crab apples - plus a 'bunch of cherries' fridge magnet! The composition looked dull and predictable until I placed the pear on the bottom edge. In my friezes I always strive for a feeling of movement and I also like to create tension by 'hanging' shapes off each other. The idea of mixing up all kinds of different imagery really came from the large public sculpture commission I did for St Davids 2 shopping centre in Cardiff (Wales). Some of these motifs come from the development work I did for that sculpture. I like the unpredictability of unlikely juxtaposition of imagery and that's the idea that I plan to develop in this series of work. 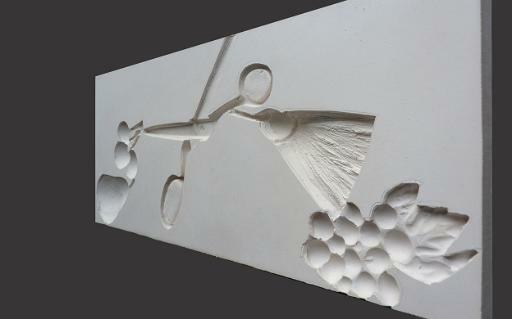 The individual wall sculptures measure approx 40 x 20cms. Of course they can also be repeated to create a longer frieze . I like the scissors and tassel with the the fruit, it creates a tension that suggests as well as questions reasons for them to be there. Apart from the psychological and purely from a design stand point the straight lines play against the organic forms. They do look effortless. People don't realize that effortless takes time. Both of those friezes are clean, modern, and at the same time have a sense history. Your work is great, I love it! Len, thanks once more for your very thoughtful and encouraging comments - I really appreciate hearing from other artists, knowing that they understand the visual creative process. You're right about the geomatric, rigid shape of the scissors working off the more organic forms - I must have made this juxtaposition intuitively I think. The sharpness of the castings are a surprise, have used this as a way of making elements to build into larger free standing Sculptures in School residencies but I go for as organic a form as possible. Moulding into soft sand so the surface between the defined forms is natural and rounded and sand breaks and falls into the details abstracting the forms used to make the impressions. Then casting with coarse cement or pink builders plaster to continue the organic look. I must try a blog like this.. such a great way to show work, I have used flickr for the last few years but it depends on finding a set of photos and you only read the description when you open an individual photo.